Step 4: Pull up the Control Center on iPhone and turn on Airplay, and select AnyCast dongle to start mirroring. Step 3: Your device can connect to the WIFI router to keep internet surfing. WIDE COMPATIBILITY: The Wifi display dongle is compatible with smartphones and tablets such as iPhone, Samsung, Sony,iPad with Android 4.2 and iOS 7 above, eg iPhone8,8 Plus, 7/7 Plus, 6/6 Plus, 6s/6s Plus, 5/5C/5s , 4S/4, SE, iPad 2/3/4/iPad mini/Air/Pro, Samsung/Google/Nokia/HTC/LG, etc. With this wifi display receiver, you can easily share high-resolution media files with friends and family. EASY OPERATE & PLAY: The upgraded Dual-core supports Play more stable and Fluently and easy to use. 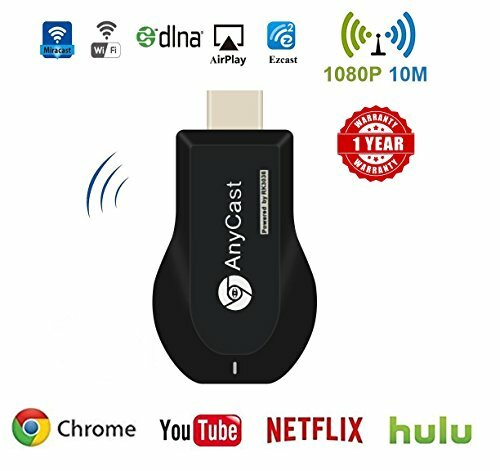 No App or drivers required, only 3 steps to enjoy media on large screen: Plug->Connect->Mirroring by using Miracast, Ezcast, DLAN and Airplay. Support : Chromecast, Google APP YouTube, Netflix, Hulu, Prime, ect. HIGH LEVEL OF SECURITY: The Wifi HDMI Dongle meets stringent CE & ROSH certification requirements for product safety, which drastically reduces the risk of fire, overheating and disconnection compared to other hdmi dongle. Note: Before you use, pls switch the TV signal source to HDMI first. And pull out the USB Plug when not using. If you have any questions about this product by AG-So-So, contact us by completing and submitting the form below. If you are looking for a specif part number, please include it with your message.